Summer is approaching (finally!) and I have been looking out for lightweight skinny fit suits with unique textures. Linen suit has always been my top choice in the Spring/Summer until recently when I came across with this gorgeous woven seersucker suit from River Island. They have just arrived in perfect time as I have a couple of weddings to attend in a couple of months! What I love about the seersucker fabric in comparison with linen is the smoother touch but still remains the wrinkled and puckered appearance which works so well with summer. It is the new modern essential in my opinion, everyone should own a seersucker suit. I love this new suiting collection from River Island as the fitting is unbelievably well if not perfect, well it is close to perfection for a ready-made suit. 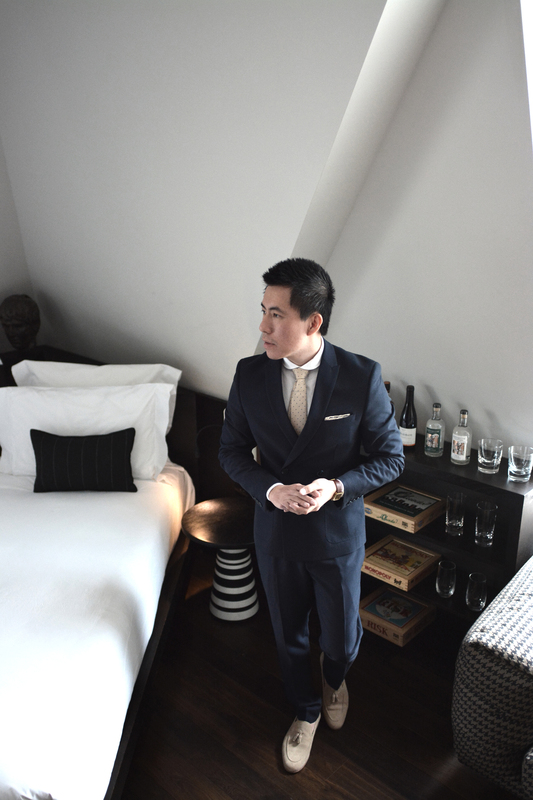 I compared it with my made to measure suit and the result is not far-off! Not many brands able to achieve this and they actually carry the jackets in 3 different sleeves length of the same chest size in short, regular and long. I am wearing Size 34 in short, and it fits me like a glove! The same applies to the trousers! This is a wow-factor for me as you are only paying for the ready-made price but in return you are getting very well fitted suit. Unless you are a model, otherwise you will understand the struggle when it comes to buying ready-made suiting! To make it slightly more interesting, I have also gone for the double breasted jacket as it looks more suave and opulent. You can easily dress it up with a button up shirt and a tie like I do, or simply pair it with a white T-shirt for smart casual. Most importantly, you need to have fun with the styling! It’s a summer wedding after all. I have added a pocket square and a tie in stone colour with navy polka dots to go with the suit. I love the earthy tone of the accessories to make it more fun and yet relevant. If you are someone who loves bright colours, I would suggest you to accessorise the suit with bolder colours such as red, green or even burnt orange. These stone suede loafers with tassels from River Island are great for the summer too with a pair of no-show socks. You can see the wrinkled/puckered texture from the close up image above. 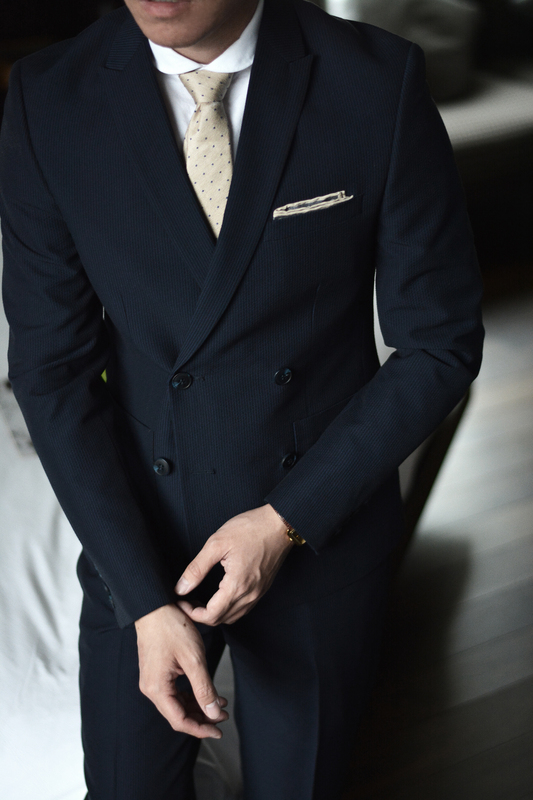 And the thin striped fabric also gives it an understated charm as supposed to plain navy suit. I have also chosen a penny collar shirt for this very special occasion because I find it less corporate especially with a tie. Please visit River Island for more wedding suits that fit you like a glove! Click here! You can also follow their social media accounts below to stay up to date with their new collections and designs! This autumn, River Island presents a curated series of timeless styling essentials that transcend trend. 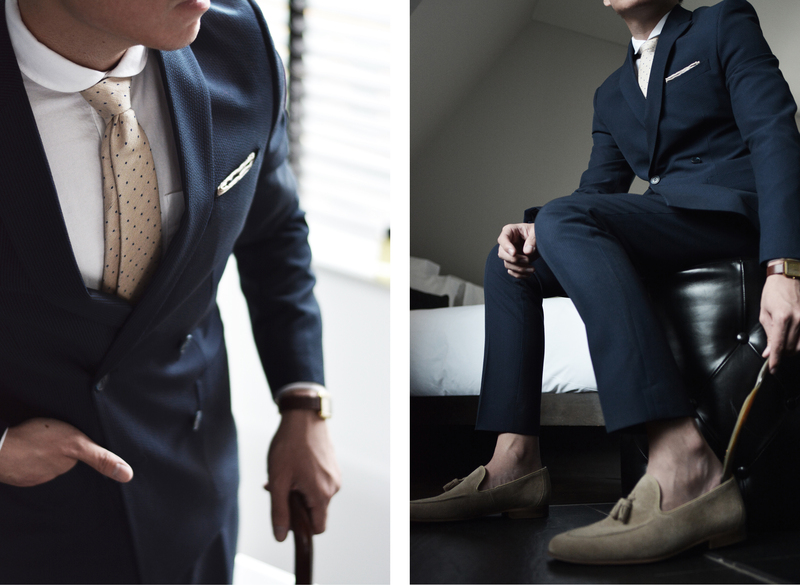 These premium essentials are great for every man’s wardrobe from head to toe. 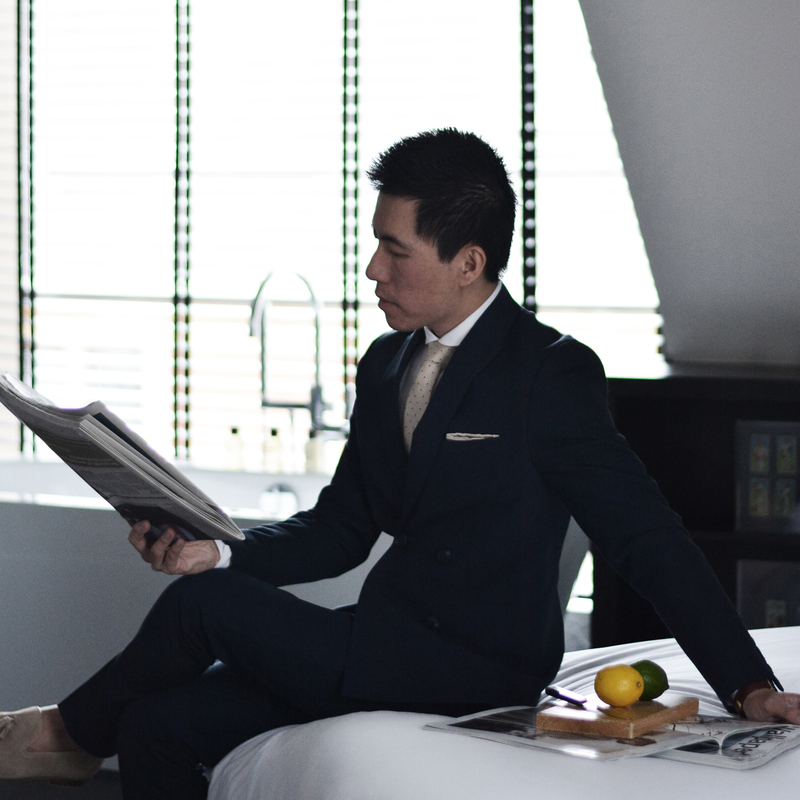 I’ve selected a few classics that will transform your wardrobe with style and versatility. They are turtle neck jumper, wash jeans, white sneakers, bomber jacket and smart coat. 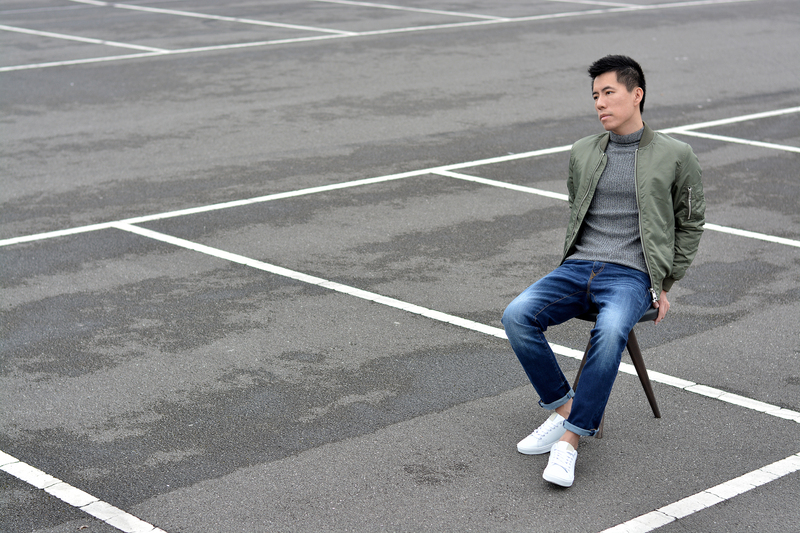 With the very same outfit but different jackets, you will see the distinction of street style & smart casual aesthetic. 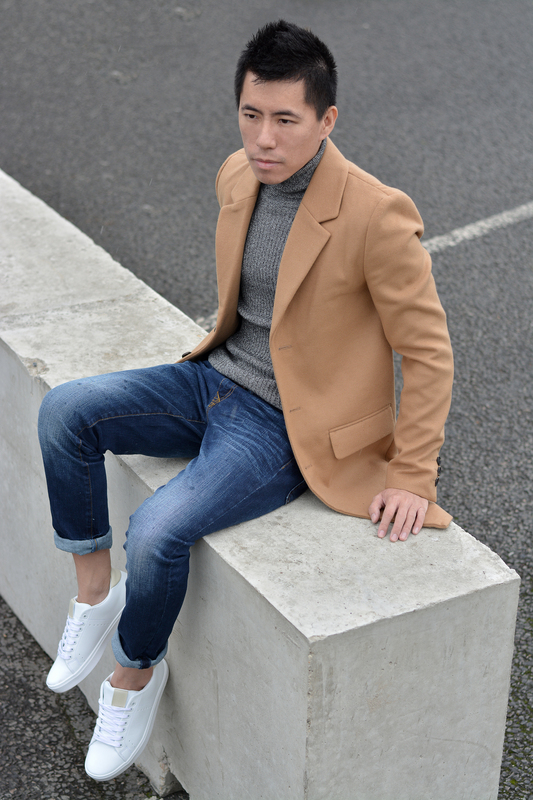 Roll neck jumper is great for casual or smart wear that transforms your image to a fresh perspective. You can also adjust the length of the roll neck to your preference which also changes the vibe of your outfit. You will notice two different lengths of the roll neck in two of my outfits. 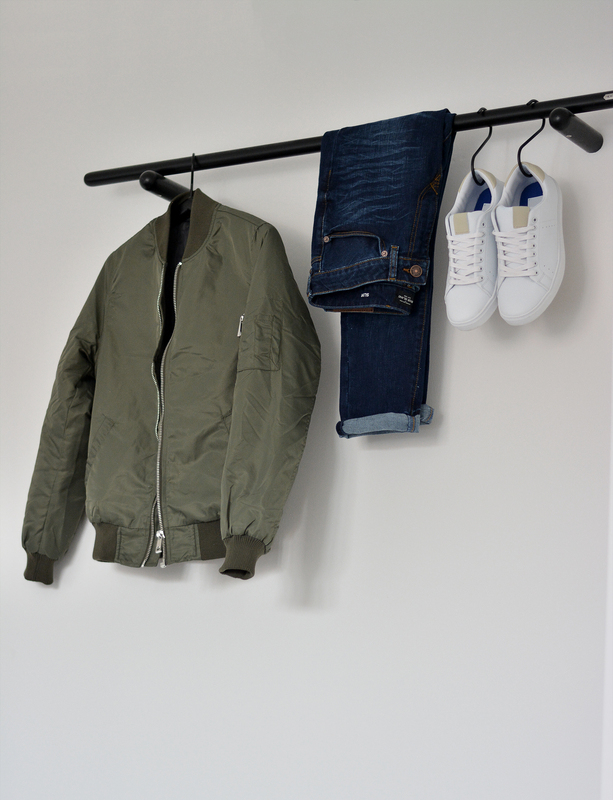 Bomber jacket is a MUST for the Autumn (and Spring too). 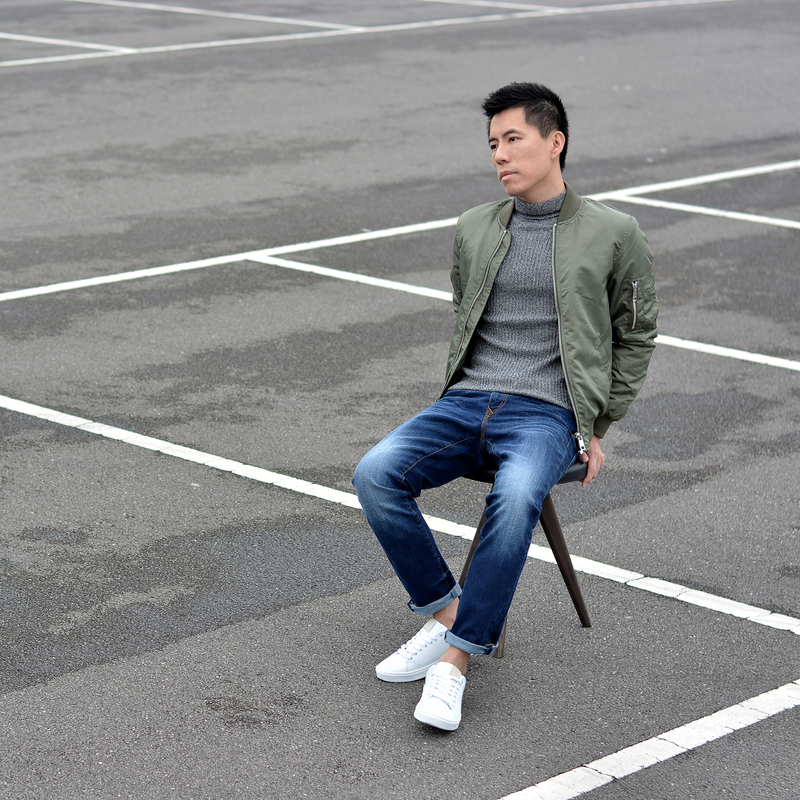 The dark green padded MA1 bomber jacket from River Island is great as all day outfit. It is great for the Autumn weather and it’s very comfortable and lightweight. Bomber jacket will never go out in fashion too. You can match it with T-shirt, button up shirt, knitwear and sweater – basically anything and everything! This also applies to the Tan smart overcoat, and the only difference is a smart coat gives you a smart look instead of too casual if you would like to impress someone in your first date! 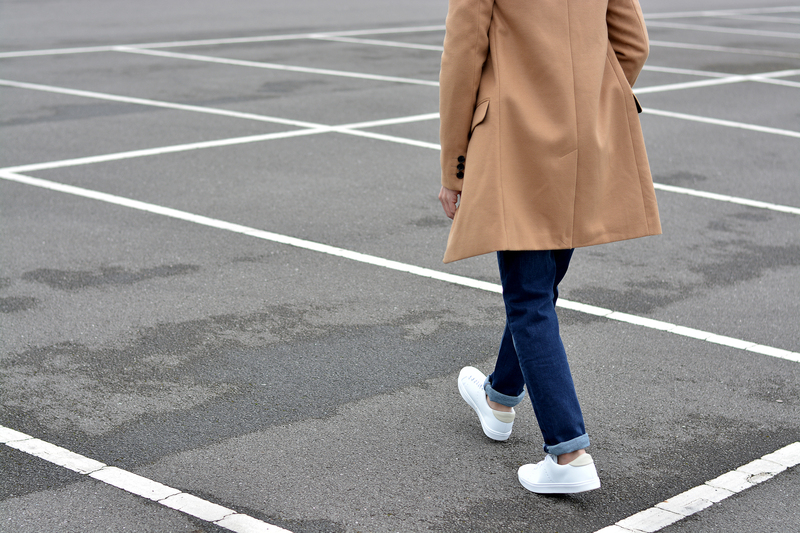 By pairing a smart coat with jeans and sneakers will make a great impression if you don’t want to be too dressed up for the occasion, you are just dressing down in a smart way. Everyone needs a pair of dark wash jeans as they go well with pretty much every piece of clothing you own in your existing wardrobe. I like the fitting of these Dylan slim fit jeans because they are not as tight as skinny jeans but the cutting of the jeans is excellent. 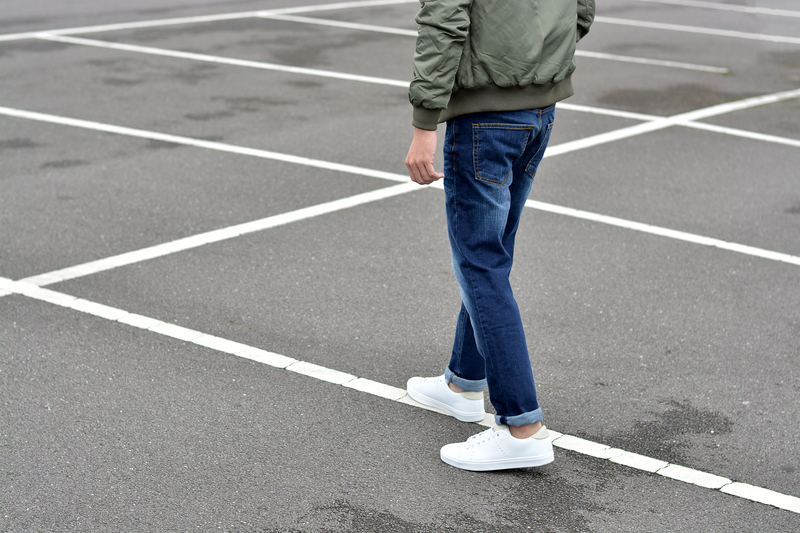 The last but not least, white sneaker is also an all time classic in fashion. I find white sneaker is such an ease to match with any outfits, and at the same time it also makes the whole look clean and sleek. But be sure you look after your white sneakers! I always keep mine spotless – or I try! 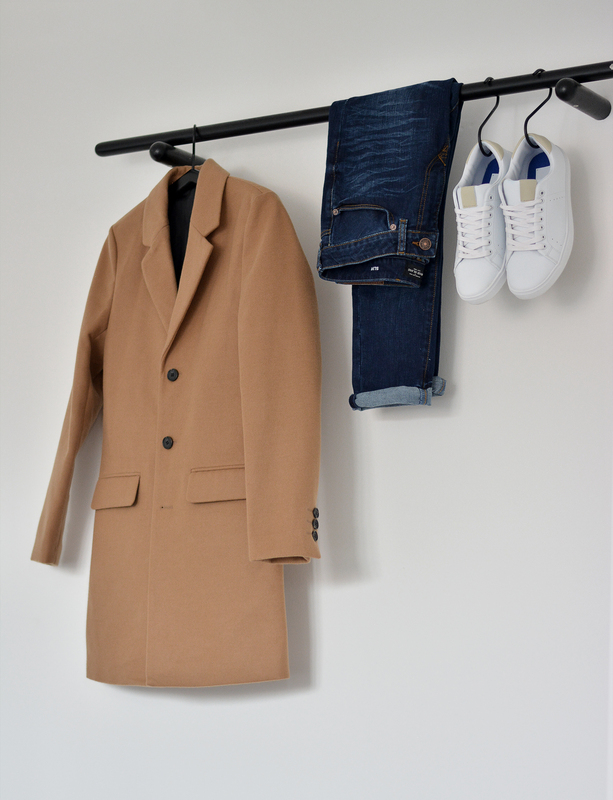 Want the chance to win yourself a wardrobe of essentials from STYLE STAPLES? Tell me what your Style Staple is on Instagram and a winner will be chosen on the 16th September 2016 to win a River Island gift voucher worth £200. You can shop the entire collection of STYLE STAPLES here!